UNIDAD is based on the innovative Unity language system and delivers the power and flexibility of Unity with a system that enables mirrored motor plans for language concepts in both Spanish and English (36, 60 and 84 locations available). The communicator can quickly toggle between words in Spanish and English while maintaining a consistent motor plan, accelerating learning in both languages. In addition, two bilingual Acapela voices – Emilio and Valeria – produce correct pronunciations in English and Spanish. UNIDAD is available for purchase as a stand-alone device configuration on the Accent 800, 1000 or 1400. The UNIDAD configuration on the Accent includes three UNIDAD vocabulary layout sizes in Spanish and English (36, 60, 84 sequenced) as well as LAMP Words for Life - Spanish/English (1-hit, Full). The LAMP Words for Life - Spanish/English language system builds on the LAMP methodology of one consistent and unique motor plan for each word. 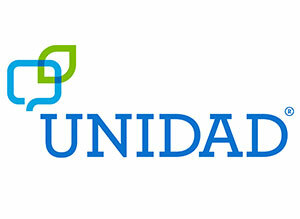 Looking for training on using UNIDAD?